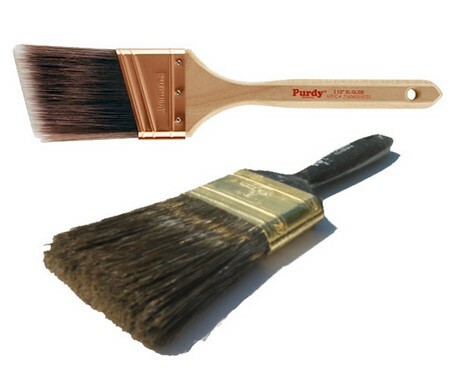 a 100mm brush for applying emulsion, textured and masonry paints to very large areas such as walls and ceilings. Paint brushes are usually made in a standard way. They have a wood or plastic handle with a metal band (called a. ferrule) attached to it. Bristles are glued into the ferrule. Some brushes have wooden filler strips in the ferrule to pack out the bristles. The bristles may be natural hog, boar or pig’s hair or synthetic (called filaments and usually nylon). The smaller sizes of brush (up to and including 50mm) usually have natural bristles and are often the type to buy, even though they are more expensive than brushes with synthetic bristles. Many manufacturers make three ranges of paint brush. Do not buy from the best (and most expensive) range unless you are a particularly experienced painter buy from the middle range instead. Avoid buying brushes with short bristles and with excessive filler strips. Instead look for a brush with an even tapered finish (called bevelling) and with flagged (split) ends to the bristles these help the paint go on more smoothly. You should always expect some loss of bristle from a new brush. The likelihood of this spoiling the paintwork can be reduced by brushing the bristles backwards and forwards against your hand (‘flirting’) before starting work and by restricting the initial use of the brush to primers and undercoats. 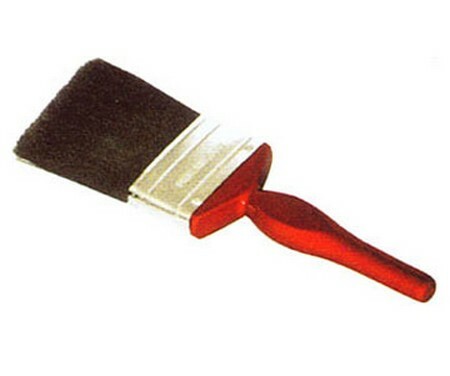 There are two useful special-purpose brushes – a radiator brush with an elongated handle and a specially angled head for painting down behind radiators, and a cutting-in brush with angled bristles for painting window bars and getting a clean edge where one wall meets another of a different colour. Brushes used for applying emulsion paint should be washed out in water as soon as you have finished with them these paints dry very rapidly. Brushes used in lacquers should be cleaned with thinners. With most other paints, brushes should be cleaned with while spirit, paraffin, turpentine substitute or a paint brush cleaner. Finish the job by washing out the brush with soap and water, rinsing it with water alone and then drying it with the bristles loosely held together in the right shape with a rubber band. Brushes used in oil-based paints can be stored for short periods with their bristles just immersed in clean water. Before using them again you should brush out the water on an old piece of board. Brushes can also be stored overnight by putting a few drops of white spirit or turpentine substitute on the bristles and wrapping them in polythene: again brush out before use.